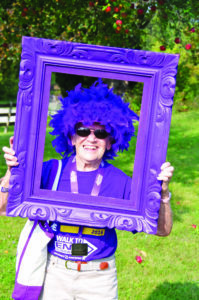 Participants set out on last year’s Walk to End Alzheimer’s at Shelburne Museum. Louise Plouffe of Williston participates in last year’s walk. 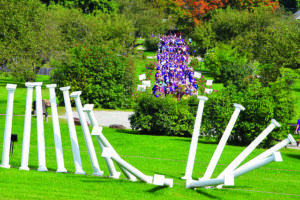 The Champlain Valley Walk to End Alzheimer’s returns to Shelburne Museum on Sunday, Sept. 16, rain or shine. This is the Alzheimer’s Association’s largest annual event to raise awareness and funds for Alzheimer’s care, support and research. Registration opens at 9 a.m. and the opening ceremony kicks off at 11 a.m. Shelburne Museum is located at 6000 Shelburne Road in Shelburne. The Alzheimer’s Association has announced a fundraising goal of $305,000 for the event and anticipates about 2,000 attendees. Roughly 43,000 Vermonters are impacted by the disease. Participants will learn more about the disease, advocacy opportunities, clinical studies enrollment and support programs and services from the Alzheimer’s Association, which is based in Williston. They will also enjoy a variety of activities during the pre-event registration period including walk-about magic by Steve Taubman, breakfast treats from Trader Joe’s and Dunkin’ Donuts, mini-massages, a caricaturist, face-painting and more. The Mount Mansfield flag and drum line will perform at the start and return of the walk. Preregistration is available at alz.org/walk or by calling (802) 316-3839 or emailing vtwalk@alz.org. Volunteer opportunities are also available.